Hello, dear neighbors ! I can safely start real cooking again ! First of all, the temperatures have finally come down and, best of all, my left arm is now well enough that I can type with both hands again ! 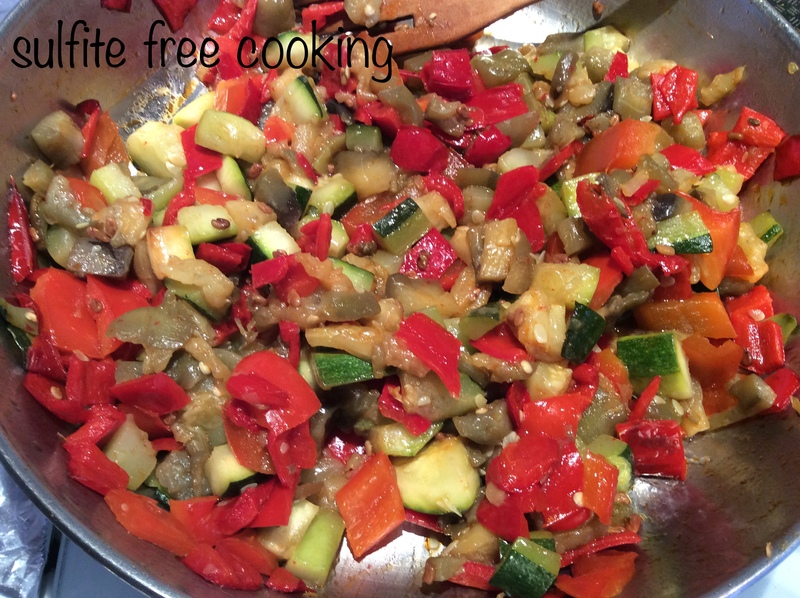 So here I am, ready to share a recipe made with summer vegetables, similar to those used in a ratatouille*, except with no tomatoes and instead the use of an interesting spice with an interesting name, fenugreek. Do you know it ? Here, « spice » does not rime with « hot ». Fenugreek is very mild, sweet even, even though the raw seeds taste slightly bitter. I love its smell! Please don’t ask me to describe what it tastes like, this is a game I am no good at. Why don’t you find out trying this recipe? *In “ratatouille” there is “touille” from the colloquial verb “touiller”, which means “stir”. You do a lot of it when making a ratatouille! I forgot to take a photo of the ingredients before starting. Forgive me? But here are the tiny fenugreek seeds. I am running out, it’s on my list for our next shopping trip! 2. Meanwhile, seed and cut the peppers in small cubes. Put pepper cubes in heated 2 TBSP oil (high heat) in a large skillet along with ½ tsp salt and half the fenugreek. Reduce heat after 5 minutes and continue cooking on low for another 10 minutes or more if you like your peppers very well cooked. We personally don’t mind a little crunch on them. 3. While pepper cubes are cooking, peel (fully or partially) the zucchini and cut up in small dices also. Turn up the heat again, add zucchini cubes to peppers for a couple of minutes, so they pick up some of the oil, then add the eggplant, and the leftover fenugreek. Lower again. Cook on low, covered, another 20 minutes. Lift the lid a couple of times to stir the vegetables and make sure the water accumulated in the lid goes back into the skillet. That’s really it. Now your kitchen smells lovely and you are feeling hungry; go ahead, start eating! You can have this dish with rice, gluten-free bread, eggs, meat, or fish. It goes really well with chicken, lamb or fish. So glad you’re feeling better – thanks for a great recipe! One of my favourite spices. Delicious! Oh, great! Thank you! What do you use it in?